Hey coffee lover! You don’t have to give up coffee to appreciate all the amazing, complex, energizing teas out there. We love indulging in a Saturday morning latte as much as the next millennial – but sometimes even the biggest coffee fans need a little break from those java jitters. Like coffee, tea comes in a wide variety of flavours, aromas and characters – from robust pu’erhs to toasty greens. The only difference? The amount of caffeine. 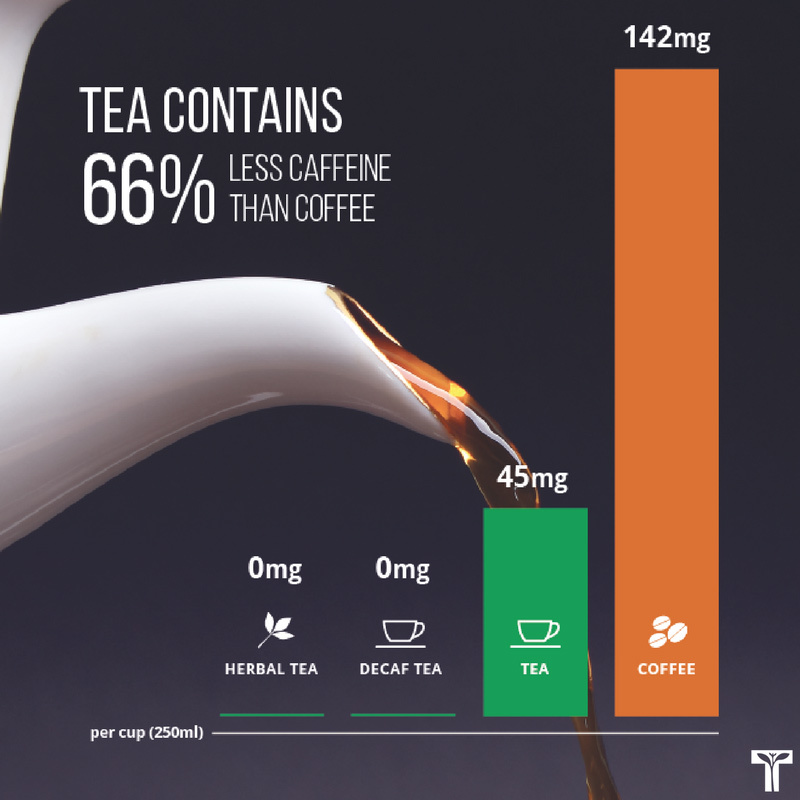 Although the average cup of tea has less than half the caffeine content than coffee does, its invigorating properties and mega health benefits are what make it a great alternative pick-me-up to your cup of Joe. Whether you’re looking for that enticingly roasted aroma, some creamy latte comfort or a productive jolt of energy, these delicious options are guaranteed to please your taste buds. Who knows, one of them might even become your new morning staple. If you’re the kind of person who looks forward to sipping on delicate light roast first thing in the morning, you’re gonna want to get your hands on a green tea. From steamed Japanese teas to pan-fired Chinese ones, green tea is delicate, refreshing, energizing and packed with amazing health benefits. Craving a light roast? Go for a one that’s lightly caffeinated and easy to drink, with a roasty kick. What do coffee beans and oolong teas have in common? They both come in a huge variety of aromas and flavours – from floral and fruity to creamy, toasty and nutty. If you love trying to pinpoint the distinctive flavours in your single-origin beans, then the unique terroir and aromas of oolong teas will be right up your alley. Oolong teas undergo a very complex process where the leaves are rolled, twisted or roasted, locking in all the exceptional flavours of the region they’re grown in. Plus most of them come from small family-owned gardens, so every blend is unique. The best part? You can drink them over multiples steeps or “gong fu” style. As the leaves unfurl with each steep, every cup is a totally new experience. Calling all espresso lovers! If you crave extra-strong fuel to get you through the day, then a pu’erh is the perfect candidate to replace your go-to dark roast. It’s got an earthy depth and strong body to give you an instant energy boost and get that metabolism rolling. Our favourite part? Like a fine wine, the tea’s flavour only improves with age. If you’re looking for the perfect Americano or double shot espresso doppelganger, reach for a cooked pu’erh since they tend to be darker and richer in taste. Can’t live without your café latte? Get your morning fix by swapping that coffee for a black tea. Darker in colour with a bold, sweet and full-bodied flavour, our black teas were born to be sipped with steamed milk and a sprinkle of sugar. It’s a delicious alternative that’ll make you feel awake and alert – without the caffeine crash. Don’t forget to top with extra froth! Which one of our coffee alternatives is your favourite?